After 50 years, Silent Spring is rarely read, but it is routinely cited as a canonical work in environmentalism. Rachel Carson is hailed as a near saint in the environmental movement. There is no doubt the book played a major role helping to spur the environmental movement in the 1960s. A careful reading of Silent Spring, however, will leave one dismayed at the relentless negative view Rachel Carson had of a time of unprecedented prosperity and improved health standards. We joined a group of authors from various disciplines who looked at different aspects of the book in historical context. That book, Silent Spring at 50, will be published in September. PERC’s latest publication, “Silent Spring at 50: Reflections on an Environmental Classic,” gives a sample of the full work. 1. Pesticides often benefit both human well-being and the environment. When discussing the effects of pesticides, Carson was entirely negative, failing to consider how these products greatly expand agricultural output, thereby allowing less land to be dedicated to cultivation, as well as having saved millions from starvation in the decade before her book was published. Her claims, such as that one might die from exposure to one molecule of a pesticide, are presented as if scientific fact. Carson ignored the reductions in habitat loss, increased no-till farming, reduced erosion and agricultural runoff that can be attributed to increased use of pesticides. 2. Bird populations were not decreasing. Silent Spring is most famous for what its title evokes—a spring with no birds, as they have all died due to pesticides. 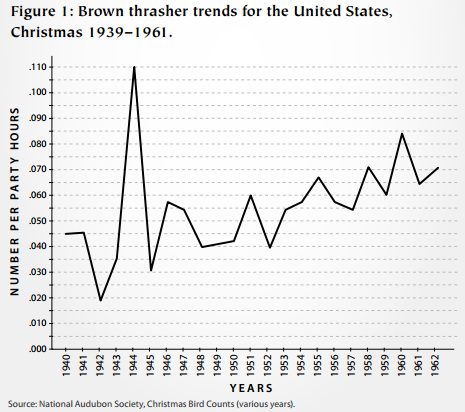 Yet Carson ignored well-known Audubon Society data that indicated increasing, not declining, bird populations in some locations she identified (see brown thrasher chart below). Could she have been unaware of the data? Not likely, since she was a long-time active member of Audubon. 3. There was no cancer epidemic. Carson asserted that one person in four in the United States would die of cancer, and that cancer was becoming epidemic in children, despite public health data to the contrary. American life expectancy had risen more than 20 years in the 20th century when Carson was writing, but she only discussed impending doom. It is true that more Americans were dying of cancer when her book was published than had in previous decades, but that was because Americans no longer died of other diseases. They were lucky enough, as we are now, to have lived long enough to die of cancer and other diseases that mostly afflict the old. Despite the furor in those days of the impending Surgeon General report on tobacco, Carson ignored the role of smoking in cancer. She never mentioned the widely-available evidence about tobacco, preferring to blame man-made chemicals for cancer. Like her successors who consistently forecast doom for the planet and its inhabitants, Silent Spring is alarmist and suffers from technophobia. It resolutely refused to recognize the billions of people, us among them, whose lives have been so greatly improved by the blessings of modern technology. My one question is about the bird population. The data presented only accounts for one species, the Brown Thrasher. 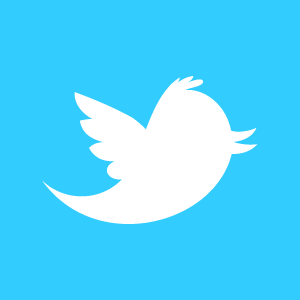 Has bird population increased for an array of bird species…. ?